Dogs in Mitch Seavey’s team howl in anticipation of the ceremonial start of the Iditarod Trail Sled Dog Race in Anchorage on March 7, 2015. (Loren Holmes / Alaska Dispatch News). When Karl Heidelbach looks out his window these days, the sight of deep snow in early March is comforting. That's because Heidelbach is the Anchorage start coordinator for the Iditarod Trail Committee, and while he's buried in logistics to ensure a smooth ceremonial start to the race on Saturday, he doesn't have to worry about melt pools, a shortened trail, or rail cars of donated snow from Fairbanks. "Having snow takes the headaches out of the equation," he said. "With a solid base, everything is covered. You can put a snow hook down. We're able to use the entire trail to Campbell Airstrip." 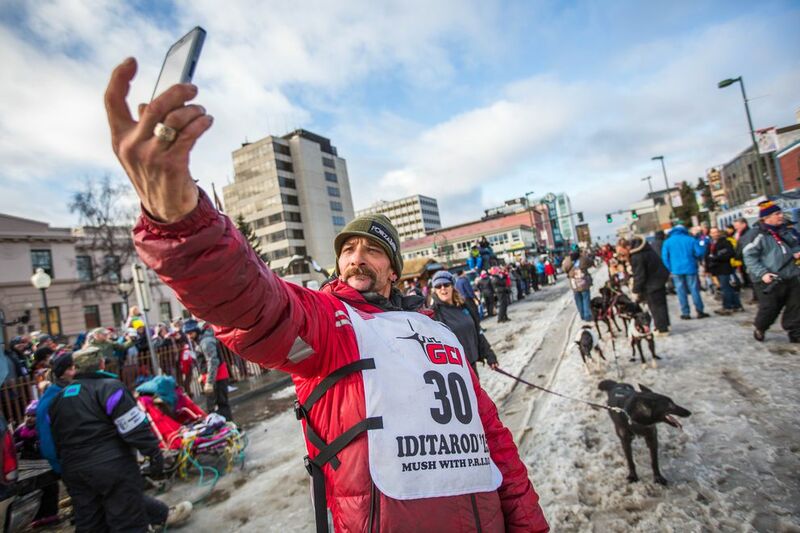 Iditarod sled dogs will be on that trail starting at 10:02 a.m. Saturday when Ryan Redington will be the first of 72 mushers to head down Fourth Avenue as the ceremonial start of the 45th Iditarod Trail Sled Dog Race gets underway. Redington is the grandson of the late Joe Redington Sr., father of the Iditarod. At two-minute intervals, mushers will leave the start line, head down the Cordova Street hill, hook up with the Chester Creek Trail, take bridges over Northern Lights Boulevard and Tudor Road and head into more wooded trails en route to Campbell Airstrip, an 11-mile trek. 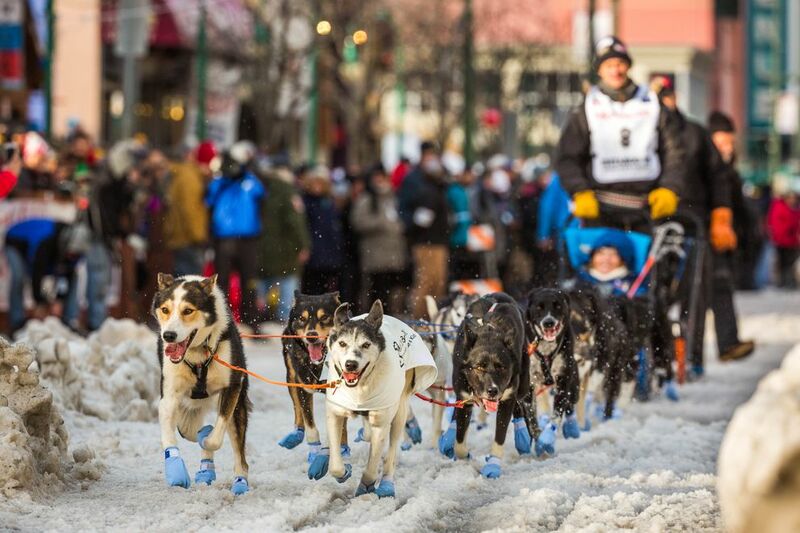 Along the way, the dogs will see more humans than they'll encounter anywhere on the 1,000-mile trail from Fairbanks to Nome, as thousands of Alaska race fans crowd the trail. High-fives will be exchanged, booties will be tossed, cheers will be heard, brats will be roasted, beers will be chugged. While ample snow helps, Heidelbach knows there's plenty to do. Beginning at 8 p.m. Friday, dump trucks brimming with snow started making the circuit between municipal snow dumps and Fourth Avenue. By the time they were done about 3 a.m. Saturday, some 200-300 truckloads, each carrying some 7 cubic yards of snow, had been dumped. From 3:30 to 5 a.m., city workers let the imported snow firm up and then mushers' dog trucks started driving over it, packing it further. Anchorage's recent chilly evening temperatures "are actually better because the snow ends up setting up better and sticking to itself," Heidelbach said. That snow will be enough to get the racers — and their Iditariders — off on their 11-mile cross-Anchorage run. Iditariders are fans who've bid for the opportunity to sit in the sled basket of a favored driver during the ceremonial start. Defending champion Dallas Seavey of Willow attracted the highest bid of $4,300. Hans Gatt of Whitehorse, Yukon Territory, got the lowest, $1,202. At least the Iditariders should get their money's worth this year. In 2016, the ceremonial start was shortened to 3 miles, ending at the Davenport baseball fields off Lake Otis Parkway, due to miserable snow conditions. The entire month of February 2016 saw just 1.8 inches of snow, leaving long stretches of trail nothing but a sheet of ice. That prompted an Alaska Railroad effort to bring seven rail cars full of snow from Fairbanks to Anchorage that misfired. Heidelbach said the snow was "at most 5 percent of what we needed" and was littered with lumber, sticks and rocks. "It was clearly not ever suitable. We couldn't even run it through the snow-blowers to make it usable." 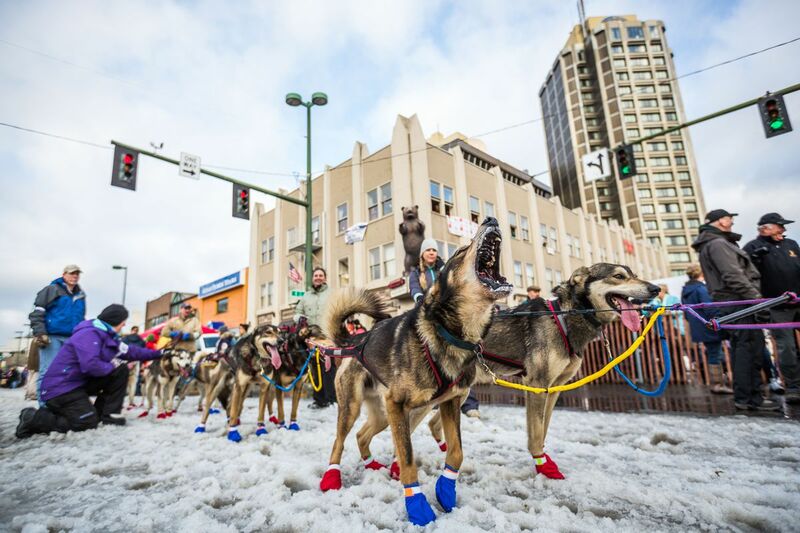 But this year, a lack of snow doesn't pose a problem for the Iditarod start (although the restart had to be moved from Willow to Fairbanks because of poor snow cover in the Alaska Range). 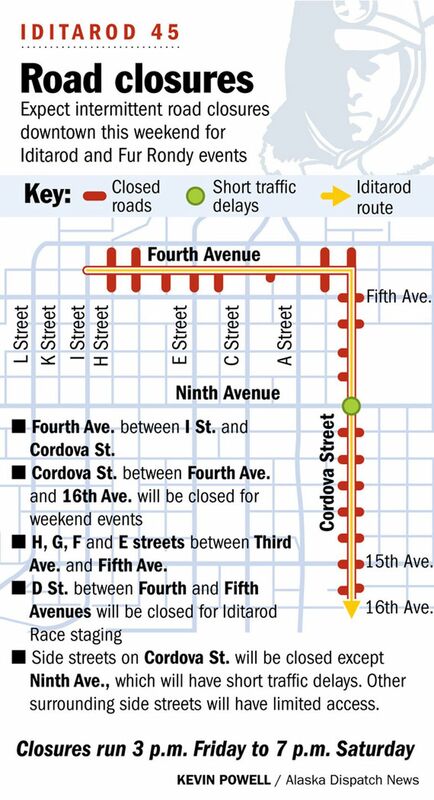 There will be several downtown street closures related to the Iditarod. The stretch of Cordova Street used by mushers was closed as of Saturday morning. 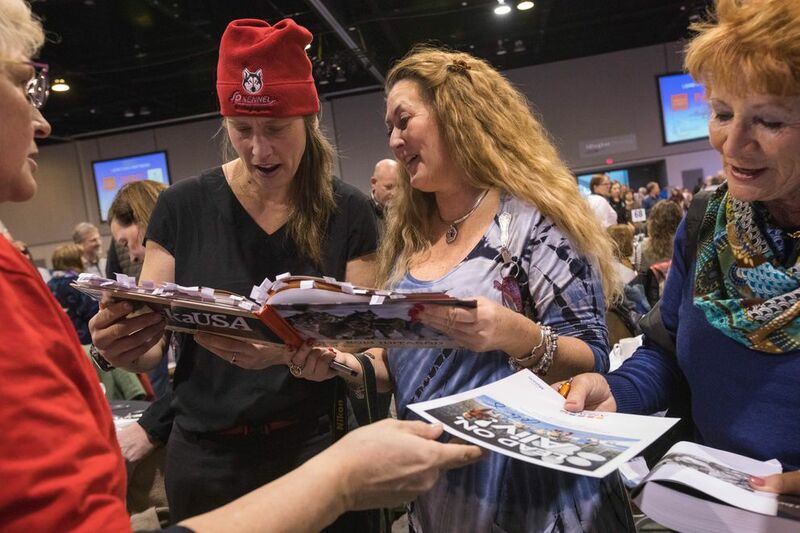 The ceremonial start brings several million dollars to Anchorage each year, according to a 2015 presentation by the University of Alaska Anchorage Institute of Social and Economic Research. The 2003 Anchorage ceremonial start filtered $6.8 million into the economy, most of that came from spending by visitors, according to an ISER report, and officials there believe it should be at least as much today.